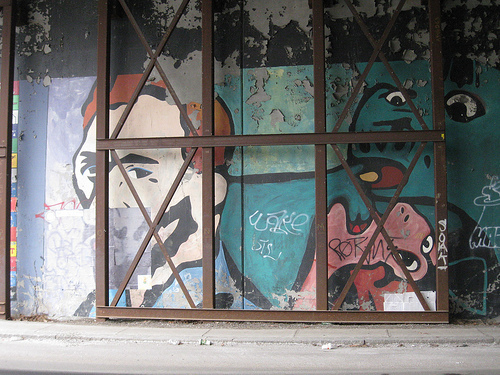 Mural on Wickenden Street overpass. Photo by Jef Nickerson. RIDOT announces ceremony to start the destruction of the old Route 195. Governor Donald L. Carcieri and the Rhode Island Department of Transportation (RIDOT) will hold a Gold Wrecking Ball event to celebrate the demolition of old I-195 in Providence. It will take place on Monday, November 15, 2010 at 10 a.m. 1:30pm at old Exit 2 “Wickenden Street/India Point” on top of old I-195. During this project, RIDOT will be demolishing over 3,500 feet of old I-195. Other contracts demolished an additional 1,500 feet of old highway. Old I-195 was built in the late 1950s and was officially closed in late 2009. The demolition of old I-195 will open up about 35 acres of land which will be used to build new streets throughout Providence. This includes about 20 acres of new parcels that will be used for private development and new parks along the waterfront. It will also allow for the construction of a new bicycle/pedestrian bridge on the existing highway piers, which connects both sides of the river at newly proposed parks. RIDOT opened the first segment of the Iway, I-95 North to I-195 East, in November 2007. The next segment, I-95 South to I-195 East, opened in December 2008. I-195 West to I-95 South opened in June 2009. Additional on- and off-ramps are continuing to open. With the demolition of old I-195 the entire Iway project is expected to wrap up in 2012. The event has been moved to 1:30. “The Wrecking Ball” should be our big fundraiser for the year.